This week’s card is called Thinking of you and was made by Dutchess. 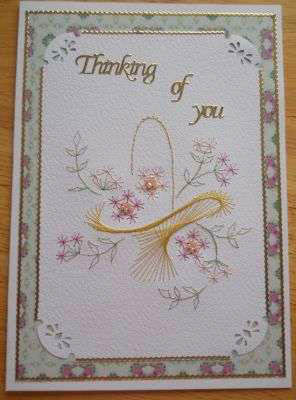 This lovely card was made using the Stitching Cards Basket of Flowers pattern. It is stitched onto a rectangle of white card with rounded corners decorated with a punch. A larger rectangle of decorative paper is mounted on a blank greeting card. The stitched rectangle is mounted on this to form a border. The words and gold borders are added with peel-off stickers.